"Está" vs "Hay": Which should you use? In a previous lesson on Spanish question words we discovered the word for "where? ": ¿Dónde? But if you're hanging out in a new town and you're looking to see the sights, there's an extra little trick to asking where something is, and it involves knowing when to use the verb estar and when to use the verb haber instead. Both of these mean "where is ______?" but they're used in slightly different situations. ¿Dónde está la cantina de Moe? Where is a police officer? 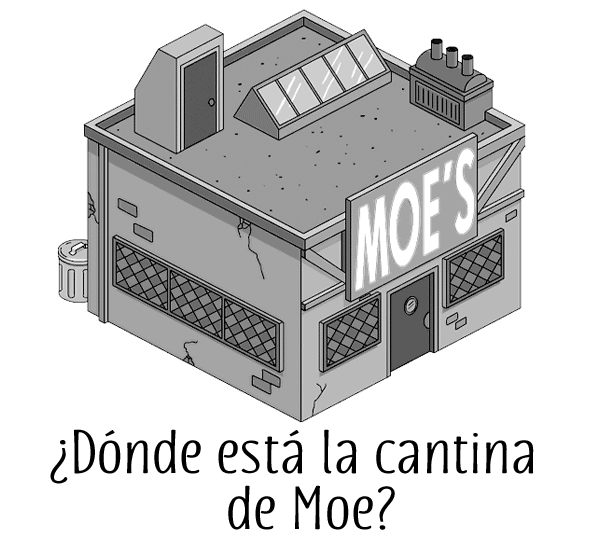 In the first example you're looking for a specific place (Moe's tavern). In the second example you're looking for a police officer: just any police officer will do. You can tell this because in the first example we've used the definite article "la" (the), while the second sentence uses the indefinite article "un" (a). You'll use ¿Dónde está...? any time you'd normally say "Where is the...? ", and you'll use ¿Dónde hay...? when you'd say "Where is a...?" ¿Dónde está la casa de los Simpson? Where is the Simpsons' house? ¿Dónde está la escuela de Bart y Lisa? Where is Bart and Lisa's school? ¿Dónde está el autobús escolar de Otto? Where is Otto's school bus? ¿Dónde está el Kwik-E-Mart de Apu? Where is a book store? Where is a pharmacy/drug store? ¿Dónde hay un buen restaurante chino? Where is a good Chinese restaurant? Your turn: Which one should you use? If Homer was looking for Flanders, what would he use? "¿Dónde hay?" or "¿Dónde está?" If Lisa was bored, and looking for just any old book to read, which would she use? Está or hay? If instead she's looking for her saxophone, what would she say? And more importantly, is it ¿Dónde está Waldo? or ¿Dónde hay Waldo? ¿Dónde hay hombres con camisas a rayas rojas y blancas? Where are there men in red and white striped shirts? — but where's the fun in that?